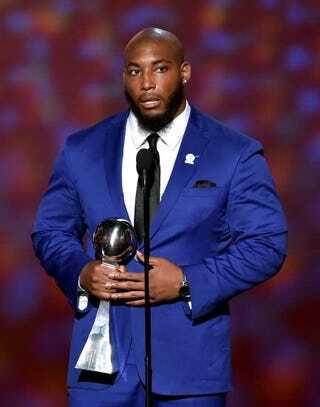 Devon Still accepts the Jimmy V Award for Perseverance during the 2015 ESPYs at Microsoft Theater in Los Angeles July 15, 2015. Cincinnati Bengals player Devon Still gave an emotional speech about his daughter Leah’s battle with cancer at Wednesday’s ESPY Awards. Leah and her dad were honored at the ESPYs and given the Jimmy V Perseverance Award. Still recalled the number of times he’s prayed that he wouldn’t lose his daughter to the disease. Still told the crowd about the choices he had to make when doctors informed him that cancer had spread throughout Leah’s body. “We could’ve lost faith and just let this battle with cancer get the best of us, or I could give my daughter’s battle with cancer a purpose, and use my platform to try to raise as much awareness as possible. … We decided not to give up,” he said. Instead of using liquor as an escape, he prayed. Still thanked the Bengals for sticking with him and being a huge support to his family. He also thanked his fiancee for not being selfish and promised her the wedding of her dreams, as long as she sticks to the budget. Although Leah was not allowed to travel to the awards show, she recorded a video message. “Thank you for supporting me while I beat up cancer,” Leah stated.